The Canadian Federation of Presbyteral Councils held its 2017 National Assembly in Victoria, British Columbia from the 15th to the 19th of October, 2017. Such an Assembly takes place annually within one of the three regional districts of the CFPC. This year it was scheduled to take place in the “Western Region” and in 2018 it will take place in one of the dioceses of the Eastern Region [tentatively within the province of Prince Edward Island]. 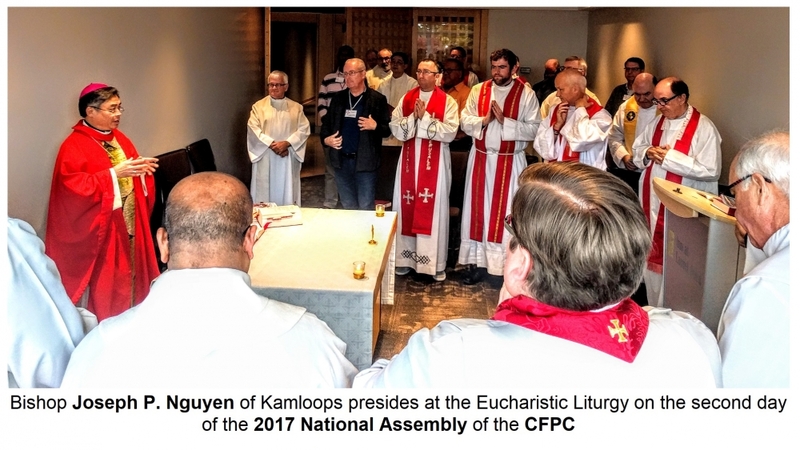 The gathering, attended by a good number of clergy representing many of Canada’s Catholic dioceses, eparchies and exarchates, was held at the Inn of Laurel Point hotel and conference facility. The clergy daily concelebrated a Eucharistic Liturgy and occasionally prayed some of the Divine Office in common. They shared meals and enjoyed times of fellowship during which they were able to better get to know brother priests from around Canada. The principal theme of this year’s Assembly was, “Ethical/Moral Issues in Ministry Today”. All talks, homilies and discussions focused on this theme in one way or another. His Excellency, Most Rev. Gary M. Gordon, the Bishop Victoria, was present for much of the Assembly and, in fact, celebrated the opening Mass and preached the homily. Later in the evening, Bishop Gordon delivered the Assembly’s Keynote Address. The second day of the Assembly was rather intense, but was filled with inspirational presentations as well as open and very beneficial discussions. The morning sessions were facilitated by renowned medical expert and bio-ethicist, Sr. Nuala P. Kenny, O.C., MD, FRCP, who spoke on “Rediscovering the Art of Dying” – the title of her latest publication that is already available from Novalis. She gave excellent, succinct presentations on the question of euthanasia and what she clarified as “medically assisted death”. As this was unexpectedly thrust upon the Canadian people by the country’s supreme court a year ago, Canadians – and, yes, their priests – have been striving to formulate the best pastoral response and guidance. Sr. Nuala helped clarify the moral complexities of so-called Medical Assistance in Dying (MAiD). She fielded many questions from the representatives inquiring about what the appropriate pastoral approach would look like for priests faced with the prospect of informing the faithful of the issues and dealing with real situations. The afternoon and evening sessions were facilitated by Dr. Michael Sy an Assessment Team Leader from the Southdown Institute. 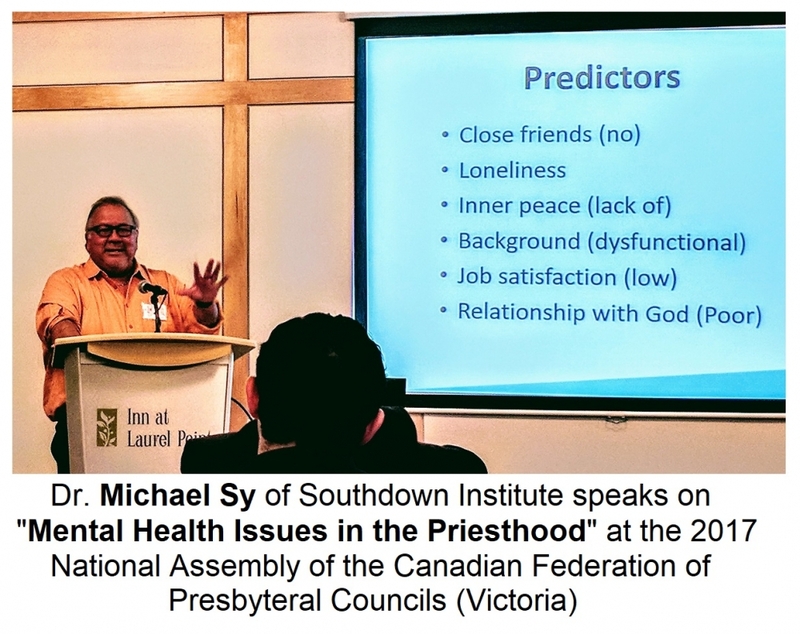 The general theme that he covered was more concerned with the individual life of priests themselves – “Mental Health Issues in the Priesthood”. His presentation and extensive Q&A approach was very much appreciated by the priests, as they were able to ask and receive answers to a myriad of questions on the health of priests. Many asked questions that regarded their personal experience and things that they have witnessed during their years of ministry. The Federation always requests ‘liaison bishops’ from the Canadian Conference of Catholic Bishops to accompany each region of the Federation by participating in all the regional meetings. The present liaison for the West is Most. Rev. Joseph P. Nguyen of Kamloops, B.C. He participated in the session discussions and joined in the Assembly prayer - even celebrating the Mass and preaching on the second day. (His parable of the ‘25 cents’ will probably be repeated from not a few pulpits around the country). Many priest-representatives agreed that the sessions were profoundly helpful and hoped that the presentations and the free discussions would one day soon be arranged for their own presbyterates. Both speakers and both Bishops made themselves available for informal small group and individual discussions throughout the Assembly. On the third day, the morning session discussed the undertaking of “Raising the Profile of the CFPC”. Long-time, albeit former, representative to the Federation from the Diocese of Thunder Bay, Fr. Alan Campeau, facilitated this session. He is best known for being the principal editor of the 2nd edition of the excellent priestly minister’s evaluation handbook published by the CFPC, “Enhancing Your Ministry”. The point of this session, which ran overtime (as they all did), was for all representatives to better understand the goals of the Federation and the richness of its already extant resources and successes. The participants also engaged in excellent brainstorming as to how the CFPC can better make itself known and, of course, better serve the priests of Canada. The results of this session will be studied and implemented by the new executive that will lead the Federation forward from this Assembly. The Federation’s annual general meeting was also held, during which regional reports were made and the CFPC’s financial statement was presented, studied and accepted. A highlight of the AGM was the election and/or presentation of new executive officers. This was required as the Central and Western Regions were in need of new vice-presidents and the CFPC was also due to elect a new president. Rev. Michael Kwiatkowski from the Archeparchy of Winnipeg was chosen by acclamation to be the President of the Federation. The other new members to the executive, which were elected by their own regions and now presented to the plenary session, are: the Vice-President for the Western Region, Fr. Gregory Smith-Windsor (Diocese of Saskatoon) and the Vice-President for the Central Region, Fr. Louis Groetelaars (Diocese of Alexandria-Cornwall). Fr. Ed Terry (Diocese of Corner Brook and Labrador) remains the Vice-President for the Eastern Region. The Federation representatives expressed their heartfelt gratitude to the outgoing members of the executive that served with dedication for six, three and one year respectively: Fr. Douglas McNeill (Saint John Diocese) as President; Fr. Michael R. Savarimuthu (Winnipeg Archdiocese) as Western Regional Vice-President; and Fr. Rico Passero (Diocese of St. Catherines) as interim Vice-President for the Central Region. The CFPC representatives look forward to presenting their report on the proceedings of the 2017 Assembly together with the wealth of shared information to their local Bishop, presbyteral council and all their brother priests. 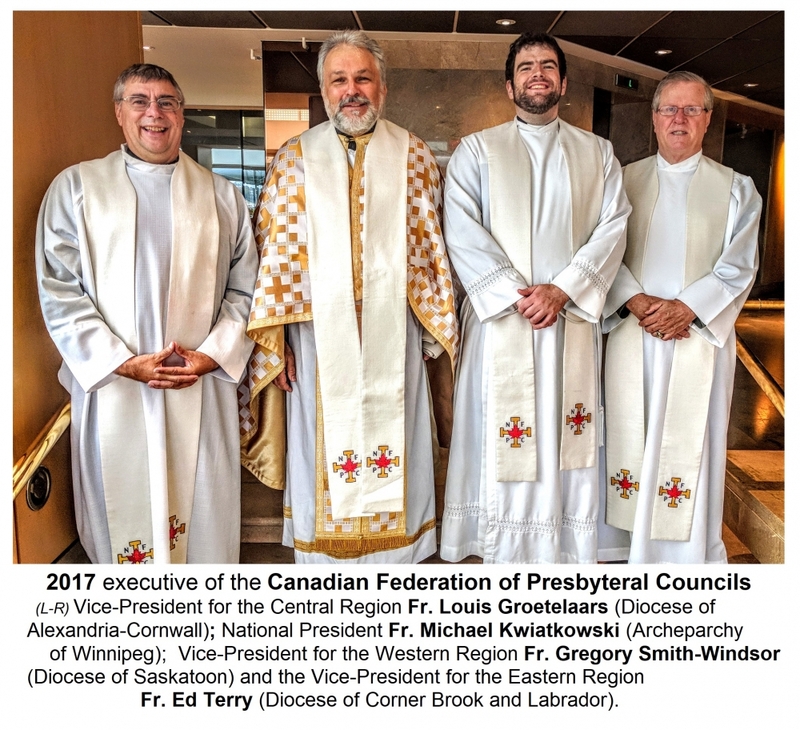 The Canadian Federation of Presbyteral Councils has been “working in a spirit of unity and collegiality with priests and bishops in Canada” since its establishment shortly after the Second Vatican Council. As stated in its vision statement, the CFPC strives to, “serve the pastoral needs of the people of God by supporting Presbyteral Councils in their role as advisors to individual bishops and by assisting priests in the integration of their spirituality, ministry and leadership”.